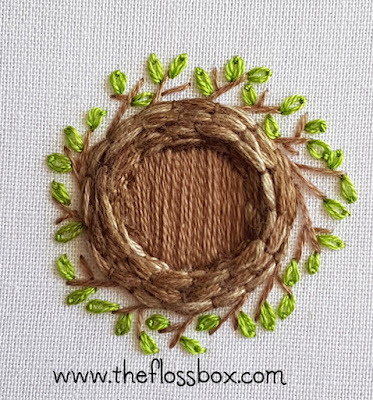 These little nests are so fun and easy to make, and I got a few questions about them, so I thought I would make a little how-to explaining how I do them. The eggs are made with polymer clay, in this case, I use Fimo. I roll up a bunch at once, often of different sizes so I hopefully have enough of a similar size for the project. Then I place the selected eggs on the fabric and measure about how big the inner circle of the nest should be to fit the eggs. I use a circle stencil to draw the circle on the fabric. Then I gather up some long embroidery floss. For this example I used the colors 642, 840, 3781, 3782, 611, two strands of each together on the needle. (Use a big needle!) Then I begin couching down the threads around the circle. I continue on around, overlapping the couch stitches with the previous round. After I have the width I like, I pile on more layers of couching over the ones I just did. I don't have any set number, it all depends on how big you want your nest to be. 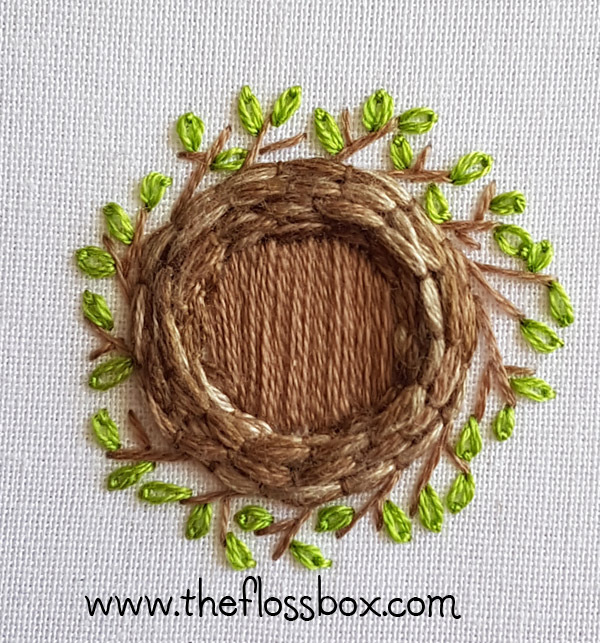 When I am satisfied, I used one of the browns to fill in the bottom of the nest with satin stitch. I usually pick a medium brown shade for the job. Then I make little branches sticking out around the nest. They are randomish, but I usually make them pointed all in the same direction. Some have an extra little branch or two on them and some don't. I use one of the medium browns for this. Then I add some lazy daisies around on the little branches with a nice shade of green for leaves. 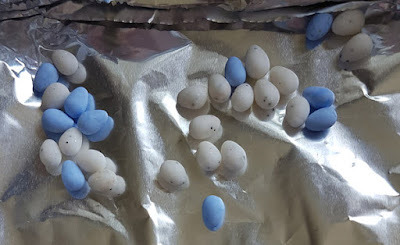 Now the nest is done, I glue down the eggs, using a clear drying craft glue such as Ailene's. It works real well for this. I hope you will give it a try!